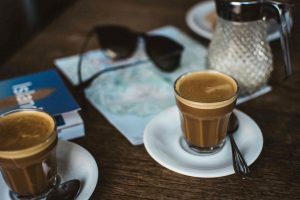 Enjoy a local espresso to beat the jet lag! Voyaging to new destinations is a thrilling adventure, but acclimating to a different time zone can take its toll on your physical health. Discover how to beat the jet lag blues with the following tips! Several days before your flight, adjust your sleeping and eating schedule according to your destination. Depending on the city you’re visiting, start waking up earlier or staying up later. By introducing new patterns early, you can help your body adapt to a new environment long before you arrive. Traveling across several time zones disrupts the body’s circadian rhythm. Daily processes, from our appetite to our sleep schedule, are affected, and this often makes it difficult to enjoy the first few days of the journey. The best way to combat jet lag is to book the red-eye and purchase a comfy neck pillow. A ten-hour flight goes by quickly when you’re fast asleep, and you’ll wake up refreshed and ready to explore. Once you go through the TSA line, purchase a large bottle of water at your gate. Staying hydrated is the key to a healthy, enjoyable journey, and it all starts on the flight. The wine might be free, but it will only dehydrate you and make it more difficult to stay asleep. Wait until you land to enjoy your first cocktail in a new country. Your body will thank you! Your body’s internal clock relies on the presence of natural light to stay balanced. Once you land, spend as much time outdoors as you can to get your body back on track. Dine outdoors, enjoy a snack in the park, or try a thrilling outdoor adventure to start your vacation off right. You might be tired when you arrive, especially if you aren’t able to sleep on the plane. Rather than crashing in your hotel room at 4 pm, stay awake until a more reasonable bedtime. Taking a nap might sound tempting, but it could further disrupt your schedule. If you’re traveling with friends, encourage each other to stay awake! Lace up your shoes, order an espresso, and head out to explore! This entry was posted on Wednesday, May 23rd, 2018	at 11:34 am	. You can follow any responses to this entry through the RSS 2.0	feed. You can leave a response, or trackback from your own site.